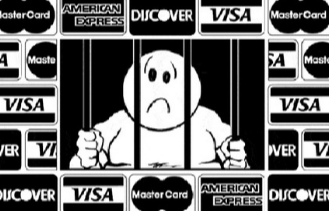 You are here: Home › News & Media › Can you go to jail for not paying your debts? Can you go to jail for not paying your debts? The real answer is no. America does not have debtor’s prisons, which was the old English and European tradition of collecting debts. Put debtors in prison until their debts were repaid. So, when someone sues you alleging you have failed as agreed to pay back the money you borrowed, they cannot ask that you be put in jail for not paying the debt. They are first asking for a judgment, which simply a document signed by a judge is saying you owe them money. They are limited to collecting money from you by garnishing wages, bank accounts or taking property that is not exempt. Exempt property differs by state, but it means that not even creditors who successfully sued you and got a judgment cannot collect that money by taking exempt property, what I call the good stuff. Sometimes money in a bank account is exempt, such as when all funds in the account come from social security. Funds from social security are exempt even after they are paid. So, if the bank holding your social security funds is served with a garnishment, they should be asking you if there is any reason they should not give the money to the creditor. It is very important that you do fill out the paperwork the bank should give you and return it to the bank while also making it clear to the bank that all funds in the account come from social security. That would presumably be easy for the bank to verify from viewing the history of deposits. The bank should then advise the creditor that an account which only has social security funds is being released back to you. Frankly, this process may freeze your access to your own funds until it is cleared up. Sometimes the creditor who got a judgment against you does not know whether you own non-exempt property like real estate other than your home or other items they can attach once they discover them. So, they may obtain an Order from the Court for you to personally attend a hearing sometimes called a hearing in aid of execution. It is a time for you to show up, sometimes with documents listed on the Order like tax returns, pay stubs or bank statements, and testify about where you work and what assets you may have. If you do own a lake home or other property not exempt from attachment, then the creditor has the right to ask you about said property so they can take the steps to collect by garnishing wages where you work, bank accounts with non-exempt funds in them or other non-exempt property. Unfortunately, by this time I think some folks have gotten in the habit of ignoring the lawsuit when they were served and also the judgment they got in the mail. They then figure they will just ignore the Court’s Order for them to appear to discuss where they work and what they own. That is a big mistake, as the Court considers that contempt of the Court’s powers in ordering the Debtor to appear. So, the Court can then issue an arrest warrant not for the failure to pay the money, but to honor the Order to personally appear and answer questions as required to do so. Of course, all of the above is frozen on the day you file bankruptcy by the automatic stay, which bars any attempts to collect on a debt after you file, and then bars any collection efforts after the bankruptcy on debts that are discharged in the bankruptcy. So, be careful about what the latest notices of lawsuits pending against you before you end the risks by filing bankruptcy.